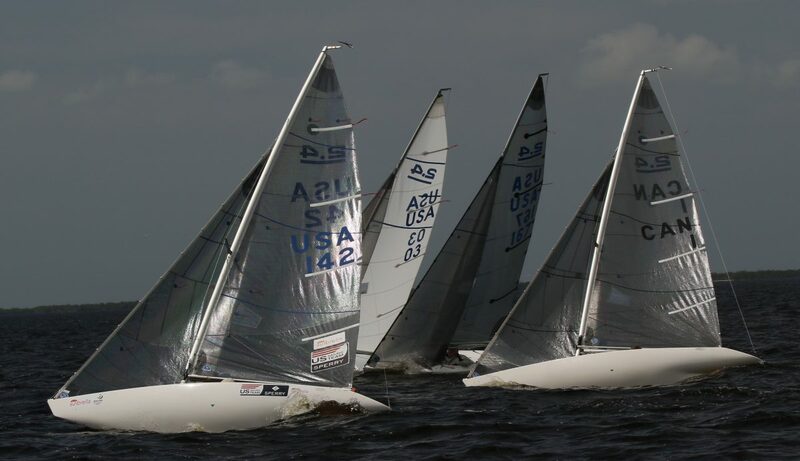 The 2018 Edge Midwinters, Regatta #3 of the 2018 CanAm series took place at the Charlotte Harbor Yacht Club Jan 27,28. Day 1 saw winds of 13-17kt, with gusts to 20+kts. The race committee set up a nice course for 3 races in lumpy conditions with Dee Smith putting 3 1’s on the board, Bruce Millar 2,3,2, and Allan Leibel 3,2,3. Day 2 was forcast to have a lighter breeze, but the fleet saw gusts to 20kt again for 2 races as the wind started to swing around to the south. Dee again showed the fleet how to get it done with 2 more bullets and first place for the regatta, Allan Leibel was 2nd with 13 pts, Bruce Millar 3rd with 19 pts. Peter Eager put the heat on the leaders day 2 and narrowly missed a podium spot with 20 points for 4th place. Thankfully the rain held off until most were done putting the boats away, next up is the Western Hemisphere Championships Feb 20th-23, then CanAm #4 Feb 24,25. A big thanks to the Race committee and all of the volunteers.